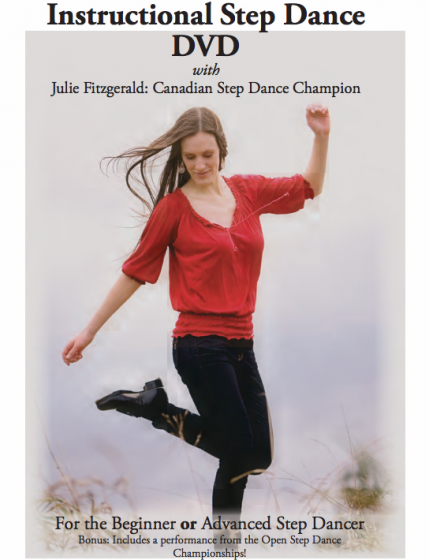 Julie Fitzgerald's Instructional Step Dance DVD! In this instructional DVD, Julie provides a demonstration and detailed breakdown of each routine so that dancers of all ages and experience levels can learn the steps with ease. Each demonstration allows students to dance along with Julie to traditional fiddle tunes. Whether you are a beginner or an advanced dancer, you will receive excellent instruction, and you will have a fun and enjoyable experience! To purchase a copy, contact Julie here. What is Ottawa Valley Step Dancing? steps are danced to a clog, jig, or reel. However, you can step dance to almost any song you want! Click here to access online step dance lessons! Julie is now offering online step dancing lessons! There are lessons for everyone -- beginner, intermediate, and advanced dancers. A variety of routines will be taught, including clogs, jig, reels, and show tunes. If you have a cool or unusual tune that you would like to dance to, please send Julie a message and she would be happy to accommodate. There are endless possibilities and lots of flexibility with this method of instruction. Julie is VERY excited to be able to offer this service!